And the view from their deck is insane! Last October, the Leelanau Peninsula Vintner’s Association held a poem contest on Facebook and I won with that entry. Of course, I was the only entrant. 😉 The cool thing was that I won two free tickets to any event that the LPVA was hosting over the course of the next year. 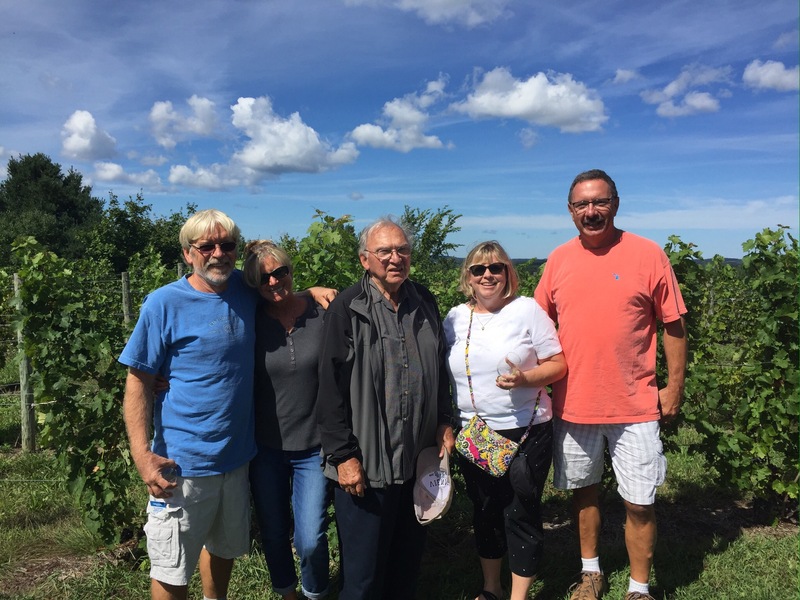 With one event left before the year was up, we decided it was time to get on the wine trail! The two day event was called Harvest Stompede, which kicked off with a series of foot races through one of the local vineyards on Saturday morning. After the races, the wine trail opened with 22 vineyards featuring one of their wines along with a food pairing. All of them offered additional tastings of between three to five pours. Our friends Patti and Lane also had tickets. Since we all had commitments on Saturday, we decided to visit the trail on Sunday. Lane was gracious enough to drive, which we really appreciated! First stop was Black Star Farms. 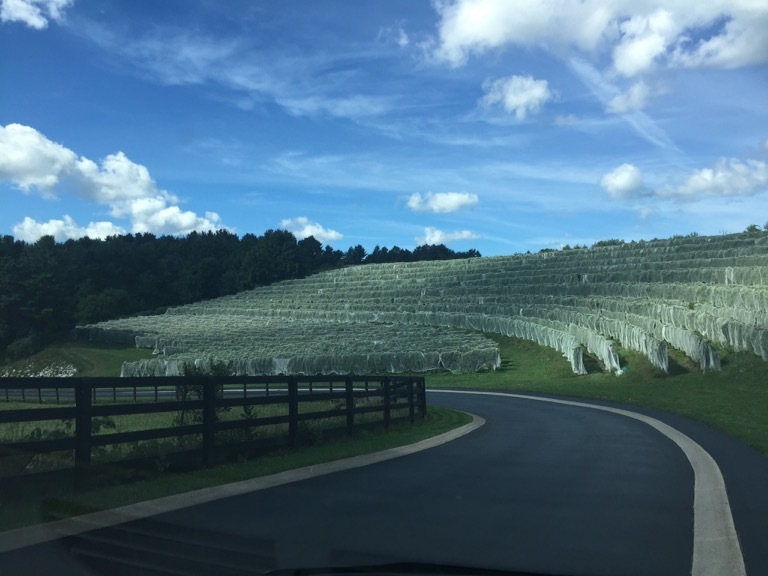 The netting on the vineyard in the photo above is used this time of the year to keep the birds from eating the ripe grapes. This has been one of Diana’s and my favorite wineries on the peninsula for years. We’ve stayed at their inn as our mid-winter getaway several times during our careers, including one magical night between Christmas and New Years Day when we had the entire inn to ourselves. 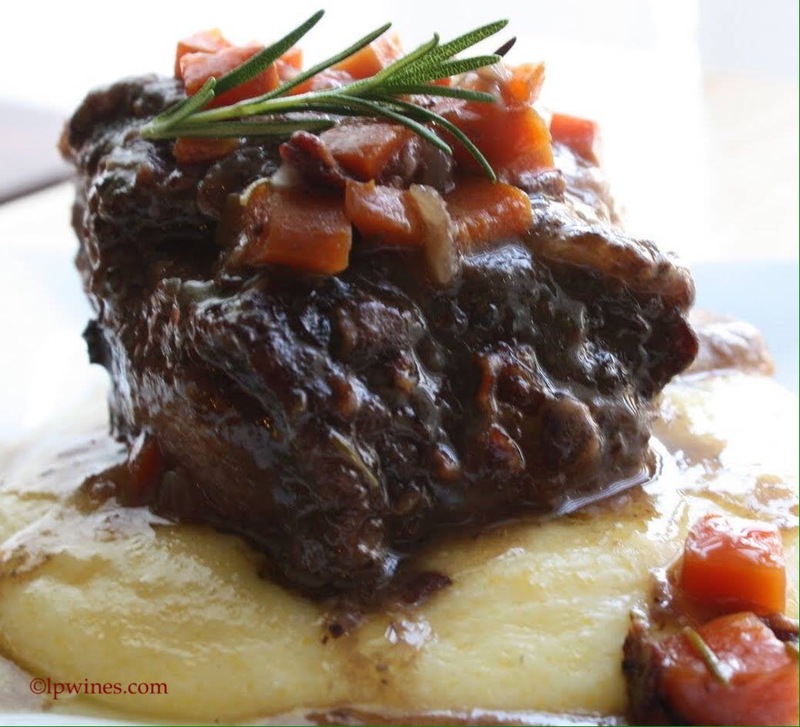 For the Stompede, Black Star was featuring tomato braised beef meatballs with a creamy parmesan polenta paired with their Red House Red. Unfortunately, I had to pass on most of the offerings for the day, due to my gluten allergy. 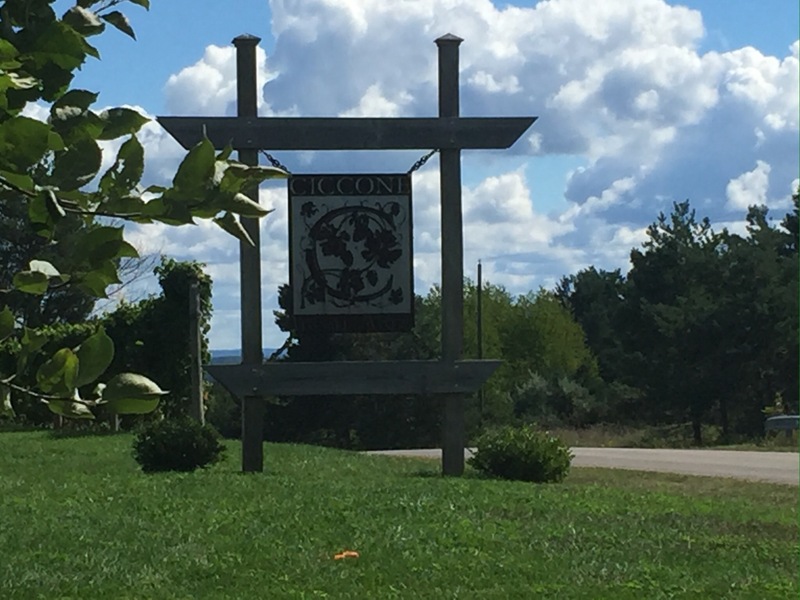 Next up, we stopped at Ciccone Vineyards. This winery is owned by Silvio (Tony) and Joan Ciccone…known to many as the singer Madonna’s dad and stepmom…but around here as pretty darn good winemakers and a sweet couple. Tony has been making wine since he was a kid in Pennsylvania. One of the things I have always enjoyed about this location is walking into the kitchen area for the food pairings. Joan usually has some Italian dish going that smells like so many of my childhood friends’ homes back in Detroit. 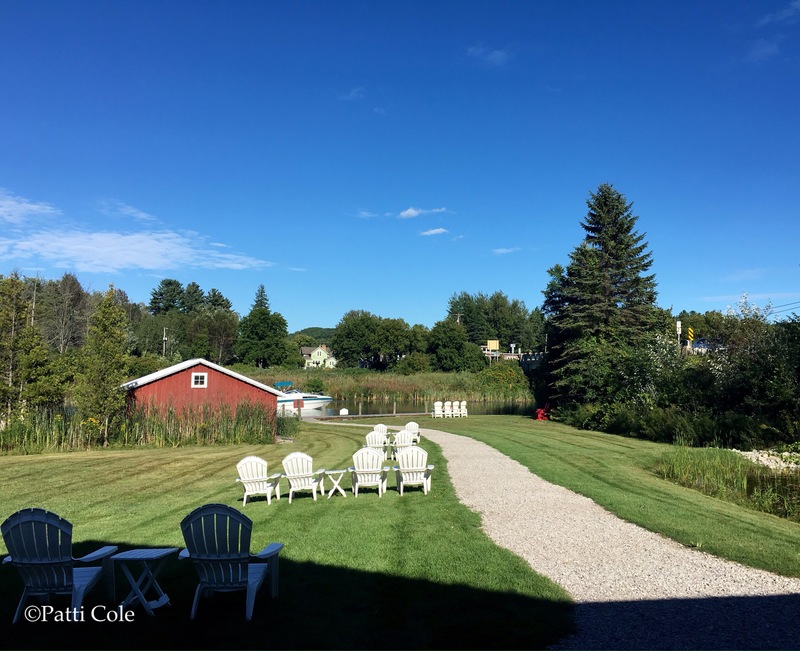 Patti wanted us to see the amazing view from Ciccone’s barn, so we walked up the hill to check it out. Our friend, Mary, has done the flowers for weddings here and has told us how great of a venue it is. This cavernous building plays host to wedding receptions and other events. This is the view looking east out of one of the windows. That’s the west arm of Grand Traverse Bay with the Old Mission Peninsula beyond it. 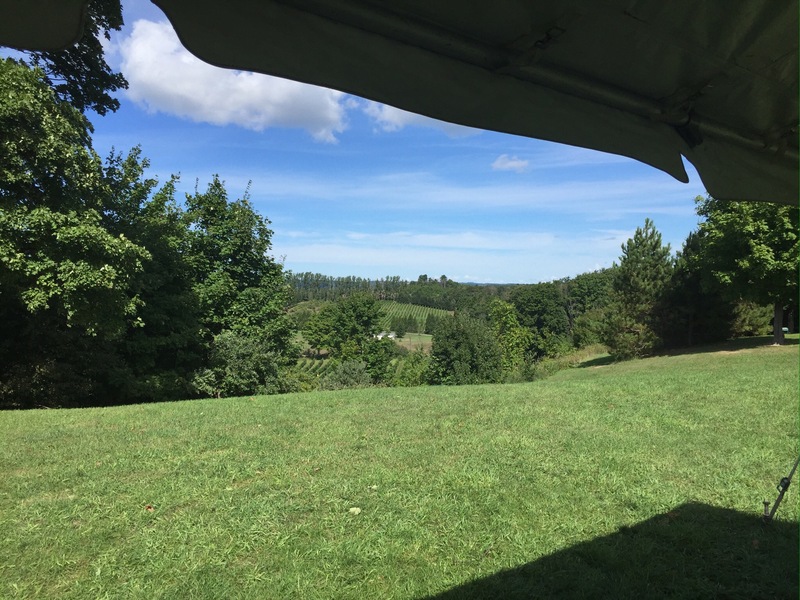 This vista looking west from a tent they had set up outside the barn. They are definitely on the top of the hill. As we were walking around, we saw Tony talking to some people who were also checking out the view. It was a nice opportunity to speak to him one on one about his vineyard. 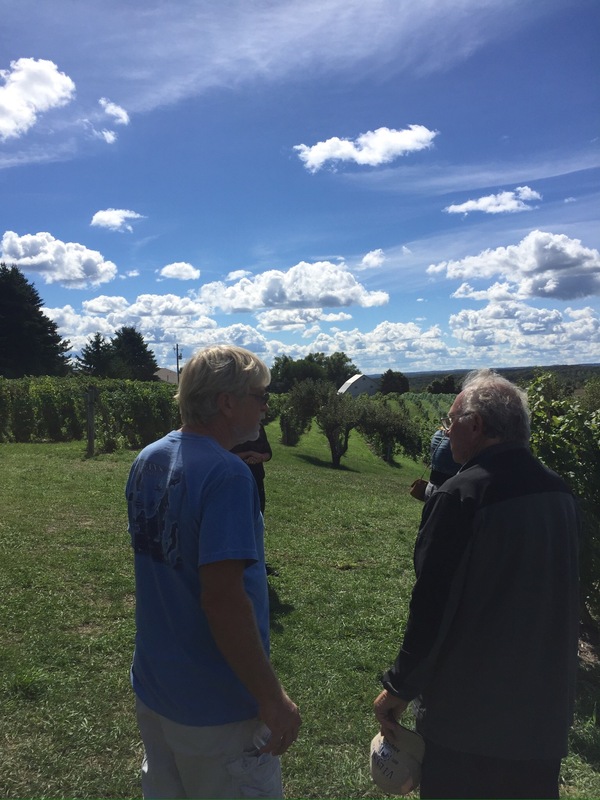 Here’s Lane and Tony discussing the different varieties that he grows on the property. 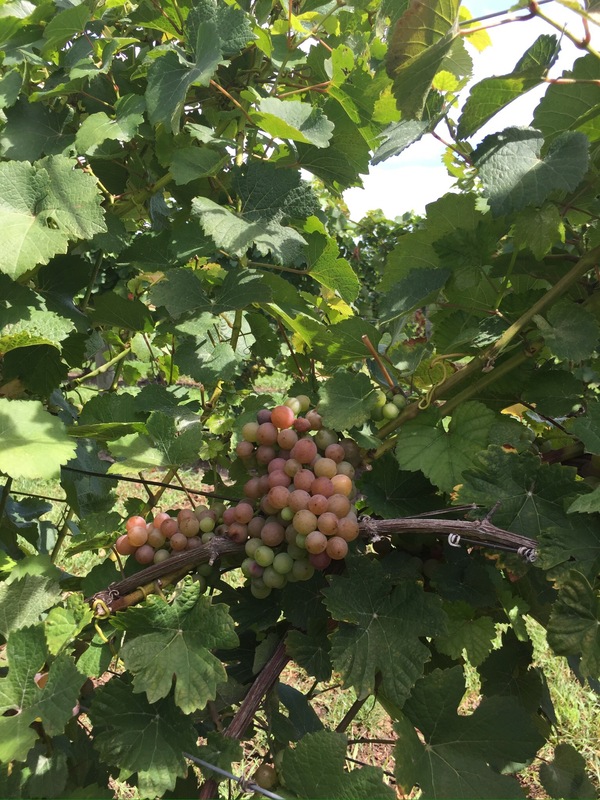 This particular type of grape is used to make Gerwurtztraminer, which is one of my favorites. Tony also told us we were welcome to come pick grapes with him in a few weeks. Hmmmm….might have to consider that one. He says he puts complete strangers at one end of each side of a row and that they know each other’s life stories by the time they get to the other end. 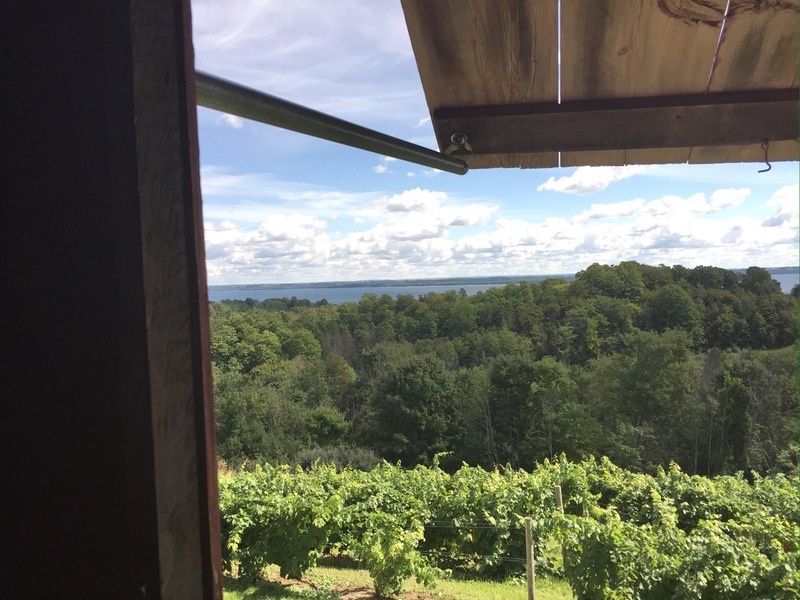 Next up…or should I say down the hill…was Chateau de Leelanau. 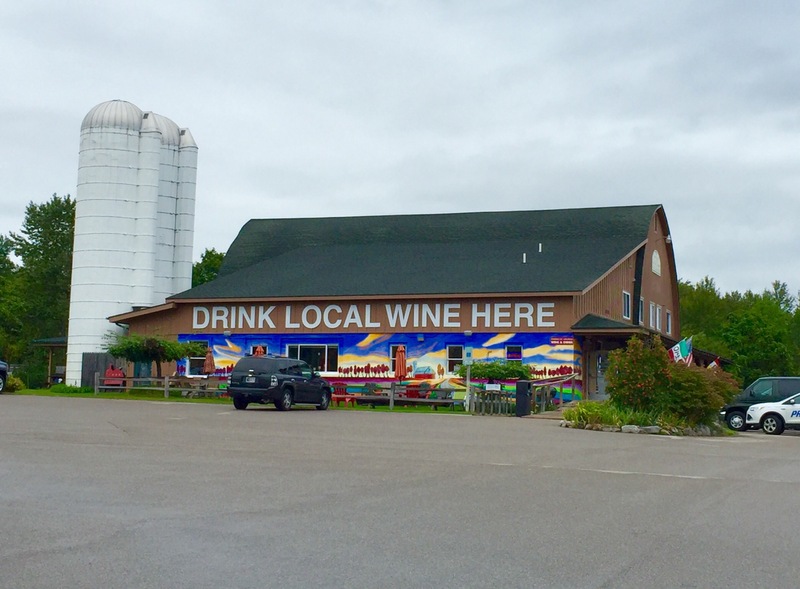 Their tasting room is in a barn with several other businesses right alongside M-22. I do have to say that the atmosphere is not what you would expect from a winery, but they definitely have their winemaking down pat. From there we dropped down the peninsula to Shady Lane Cellars. This was the subject of my limerick! Their patio is a great place to spend a summer evening, especially when they have a musician performing. 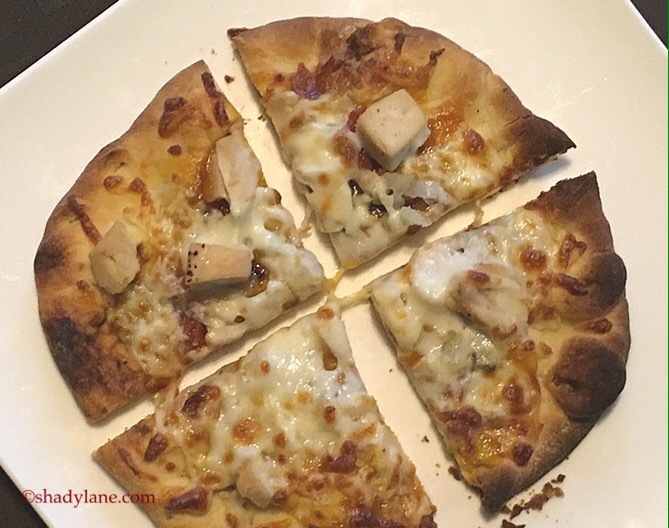 Their offering was a BBQ chicken flatbread paired with their 2014 Pinot Noir Rose. We sampled a few of their other wines, including their outstanding 2013 Blue Franc. They have what we feel are the best reds on the peninsula, and their whites are also excellent. 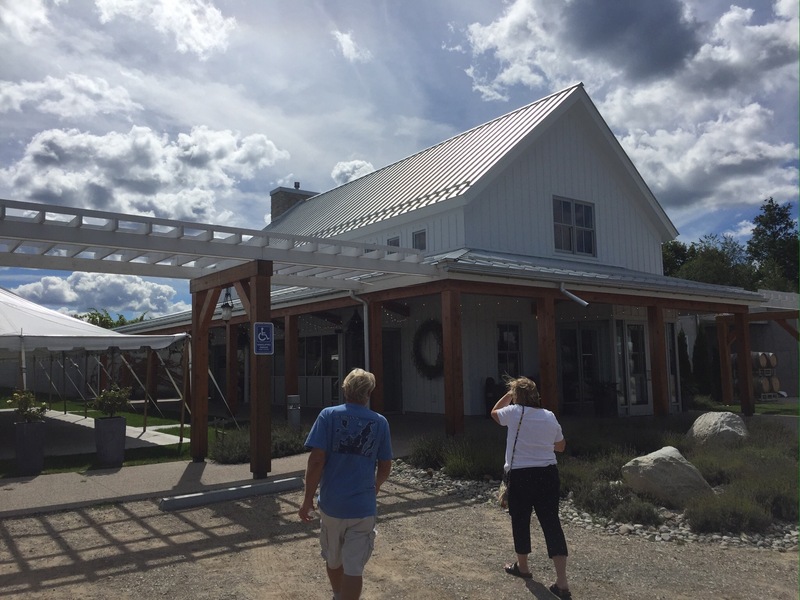 Our next stop was Brengman Brothers Winery. 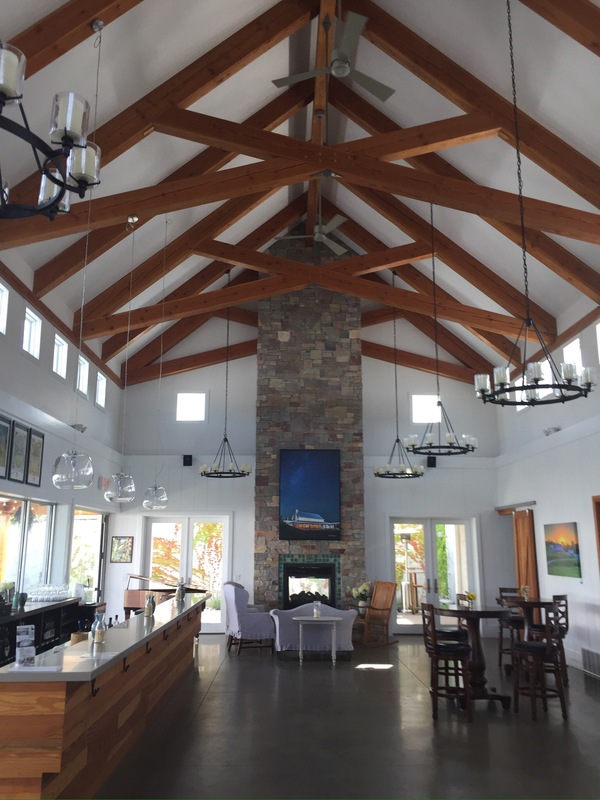 The tasting room is just gorgeous! 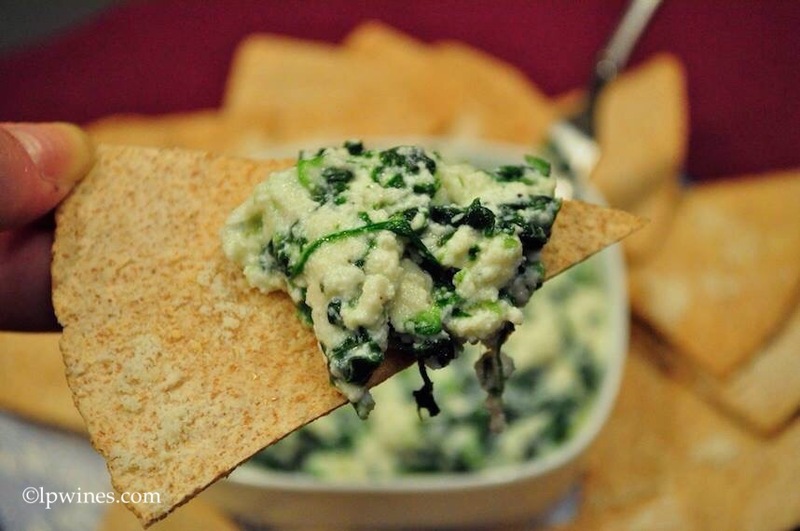 They were serving chips and spinach dip paired with a choice of their Runaway Hen White or Brengman Brothers Vignoles. 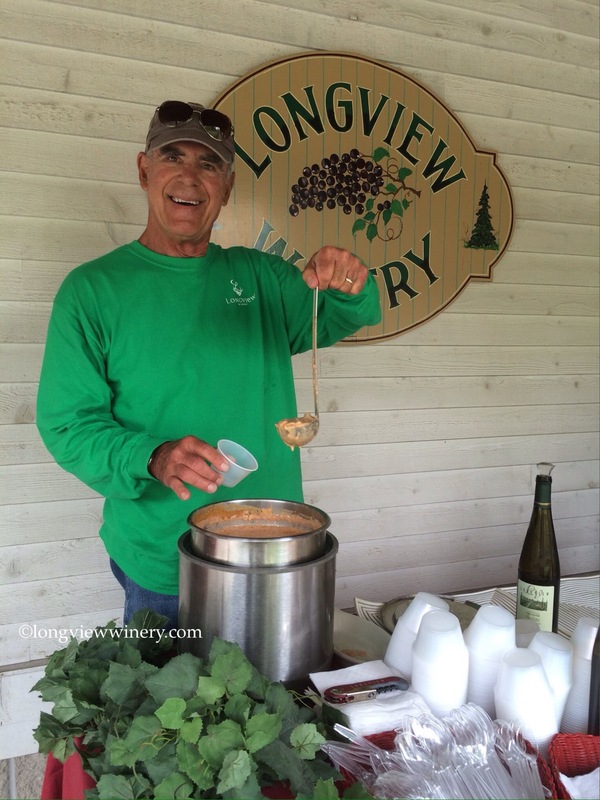 After Brengman Brothers, we headed over to Longview Winery. Winemaker and owner Alan Eaker has an outstanding cherry wine and also a very interesting cherry mead. We ended up buying a bottle of each. Here he is serving up his son’s roasted salmon chowder which was paired with his Dry Riesling. Lane said the chowder was simply outstanding. From there we drove up to Bel Lago Vineyards and Winery. 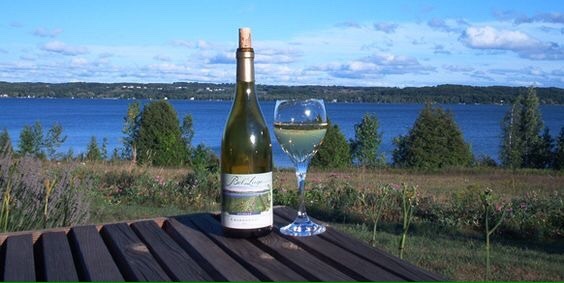 Bel Lago means ‘beautiful lake’ in Italian, as this winery sits high on a hill above Lake Leelanau. 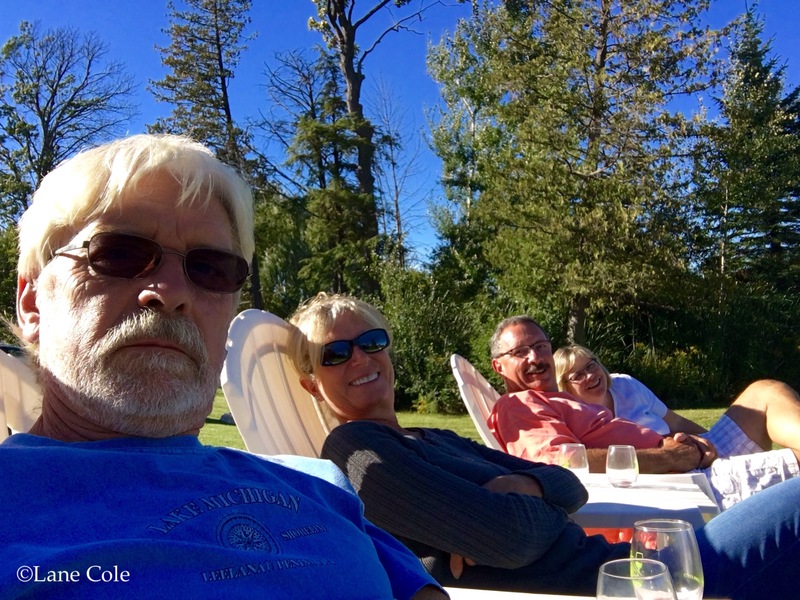 Their winemaker, Charlie Edson, is well respected in the area for his skills in producing quality wine. 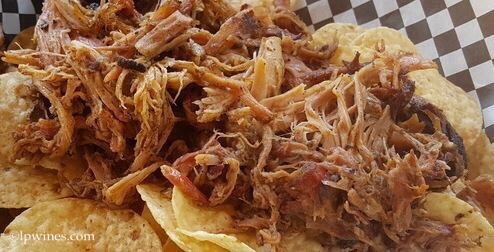 For the event, they served a smoked cherry barbecue pulled pork with cherry tortilla chips paired with Bouquetti. Lane pointed out that someone was watching the number of people coming in the door and bringing out just enough fresh servings of food as they entered. Very nice. Diana and Patti were definitely having fun! 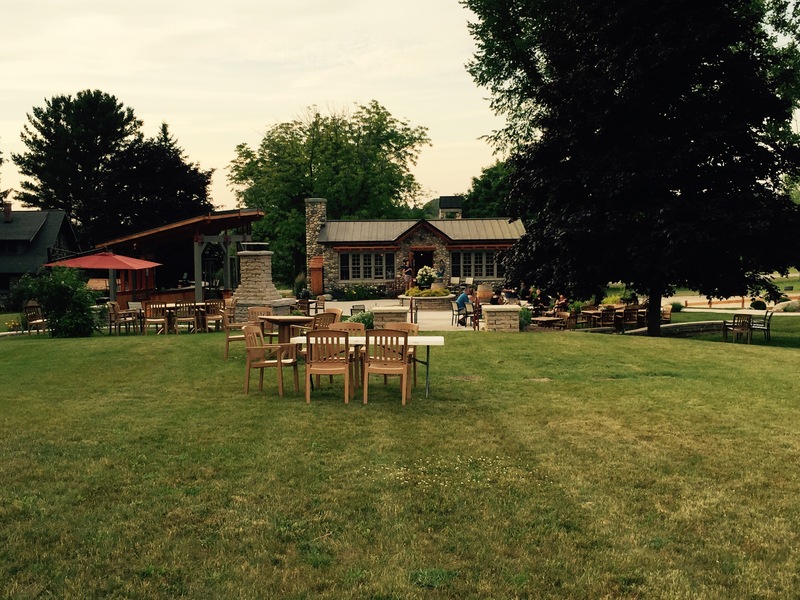 After that, we zoomed up to Laurentide Winery. Named for the continental ice sheet that shaped this region 10,000 years ago, this winery pays tribute to the earth the vines grow in. 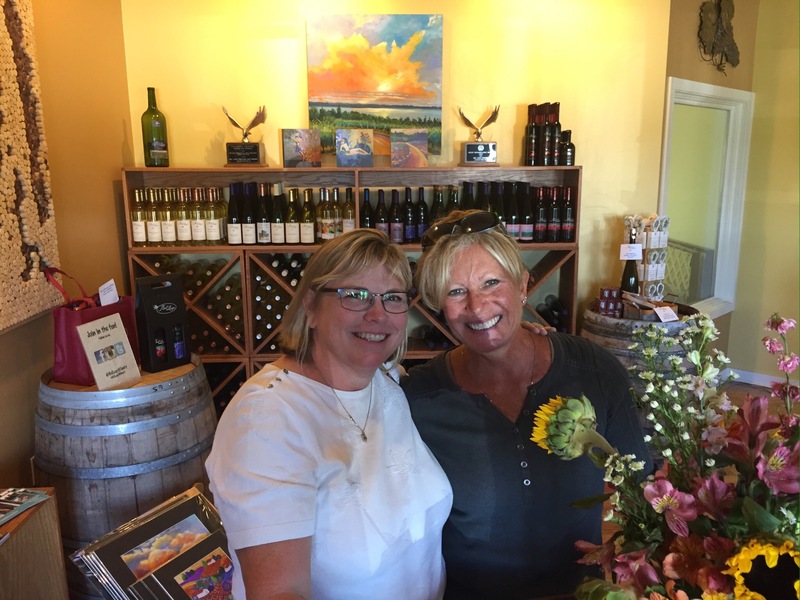 That’s co-owner Susan Braymer holding a bottle of the day’s featured wine, Sauvignon Blanc. Her and her husband Bill have worked very hard to perfect their wines and it shows. 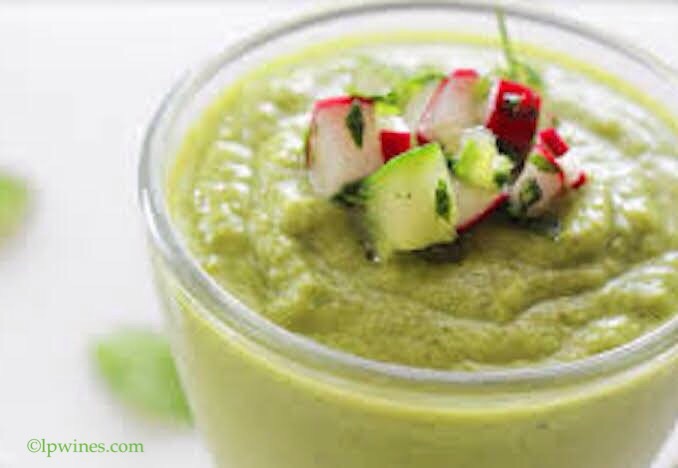 Susan’s food pairing was her creamy cucumber soup, which was served chilled. When I asked her if it was gluten free, she replied that it definitely was. Woohoo! My first gluten free pairing of the day! 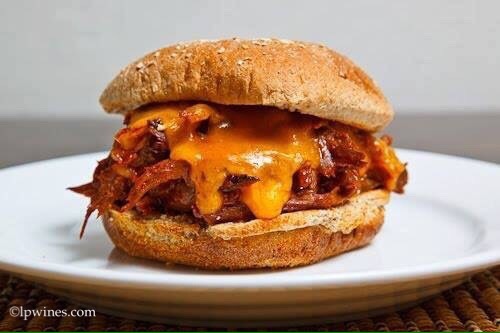 Thank you, Susan…it was delicious! 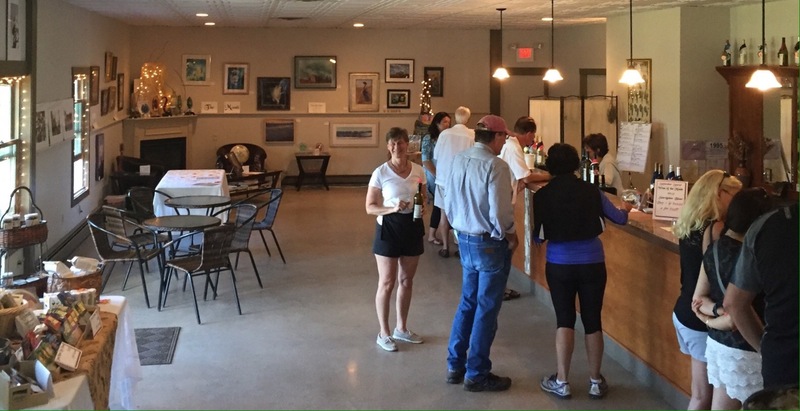 At that point the clock was ticking towards the trail’s 5 pm ending, so we made one last stop at Boathouse Vineyards on the way back to Wild Cherry Resort. This is one of Diana’s and my favorites. Their 2014 Pinot Grigio (sold out) was my all-time favorite, and their 2015 is extremely close! 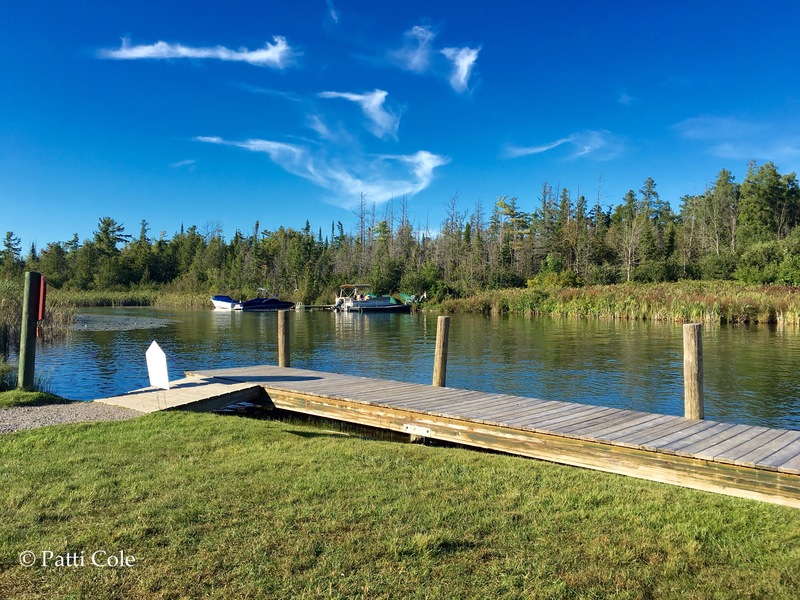 Their lawn extends down to The Narrows, which is the channel between North and South Lake Leelanau. 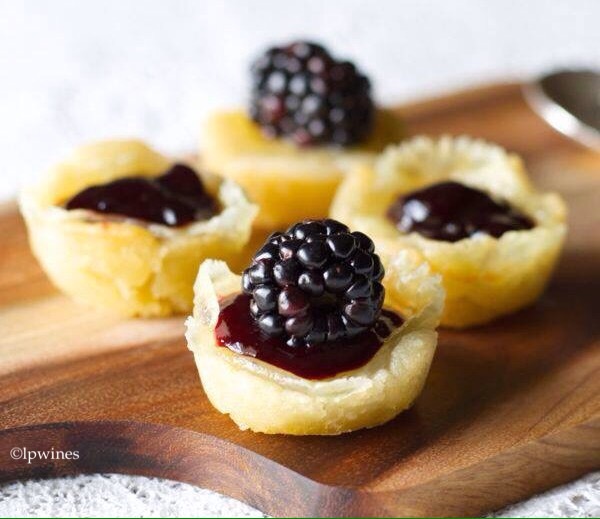 Their pairing for the day was a blackberry brie tartlet served with their 2013 Pinot Noir. 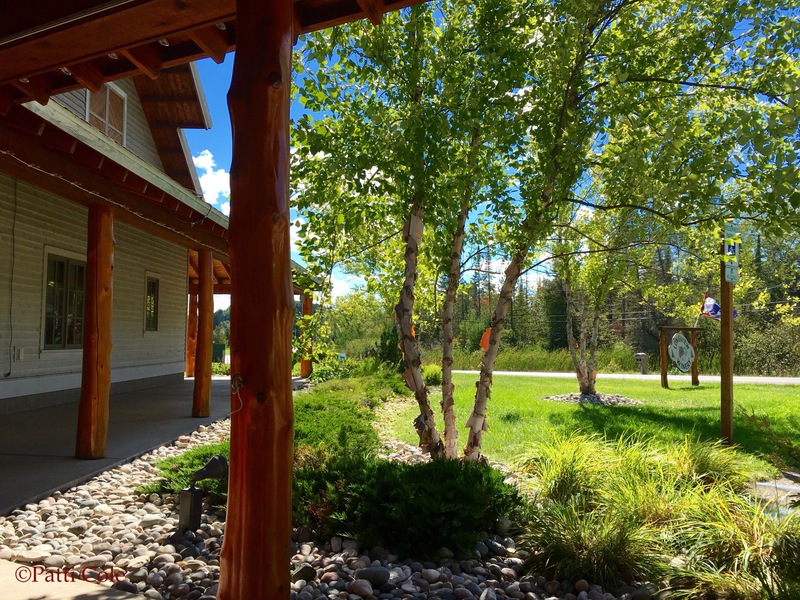 When we were done, we plopped into their Adirondack chairs and called it a day. 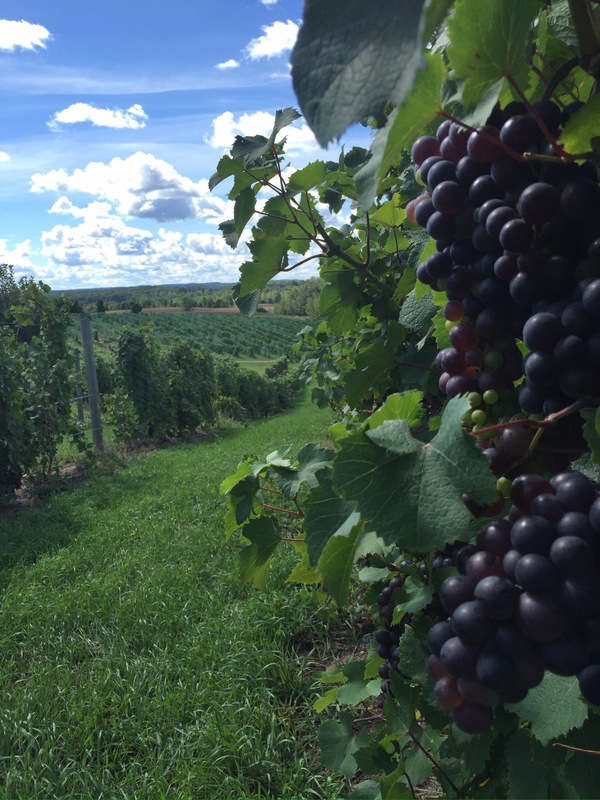 If you ever get a chance to experience a Leelanau Peninsula wine tour, by all means, do so. If driving is a concern, half price tickets are available for designated drivers (food only), or you can book a limo or van through one of the local tour services. More information on the events being held throughout the year are available at lpwines.com. Congratulations on winning the poem contest, it is obvious the best entry won! Looks like a pretty interesting area to visit, would love to visit some of the wineries. So true on my entry, Jim! 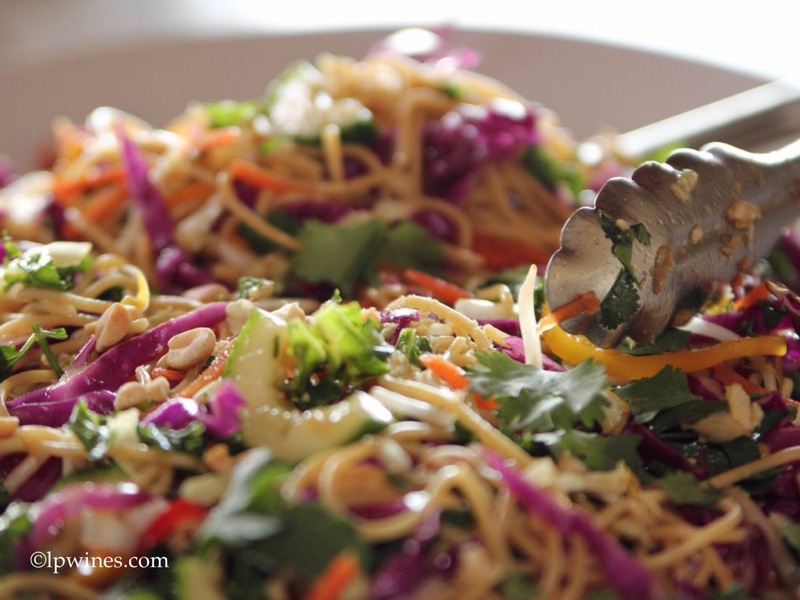 It was unequivocally THE best! I sure hope you and Barb can visit here someday. We are on the 45th Parallel and have a similar climate, so I’m sure that is why it’s possible, Gin! Wow! What a great day full of yumminess and really beautiful locations. I love that barn! Wonderful pics of the vines. Thanks, Jodee! It’s really a pretty area, and everyone is laid back and nice. 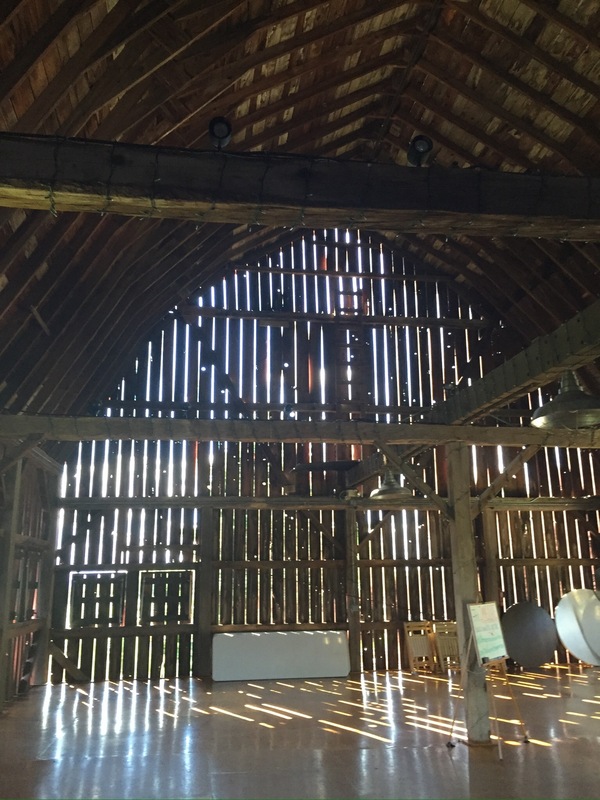 Yeah, I’m glad Patti and Mary had spoke so highly of the barn…it was really cool! What a great day. I really enjoyed following along with you. Bummer about the food though. What a pretty area! But I gained 2 lbs just looking at the pictures of food and I think Diane caught me licking the screen once,,,,, OK TWICE!! !